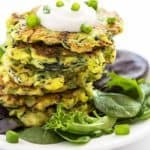 This is my second post in a series of Food Photography Tips where I show you “behind the scenes” of how I photograph my recipes. 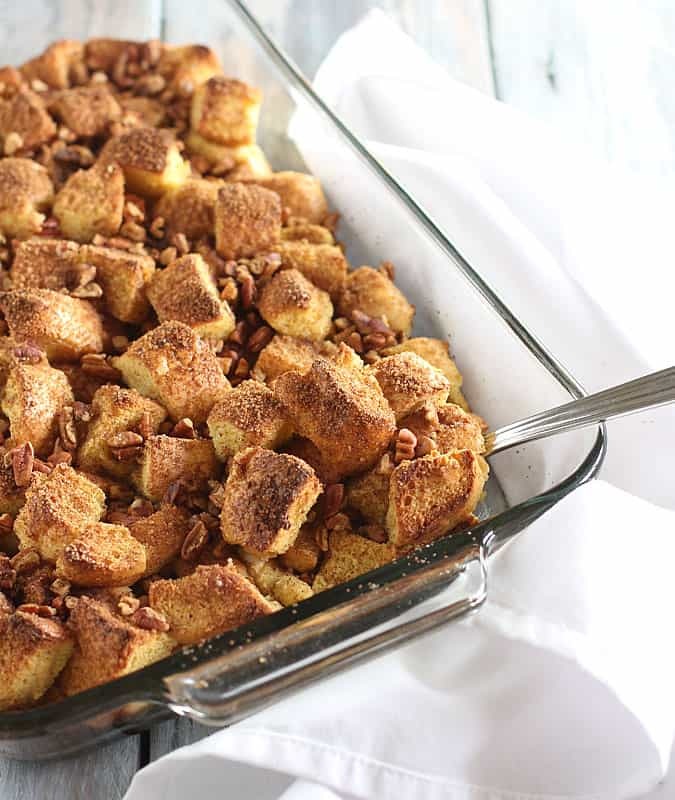 Today I’m sharing how I photographed an Overnight Eggnog French Toast Casserole. 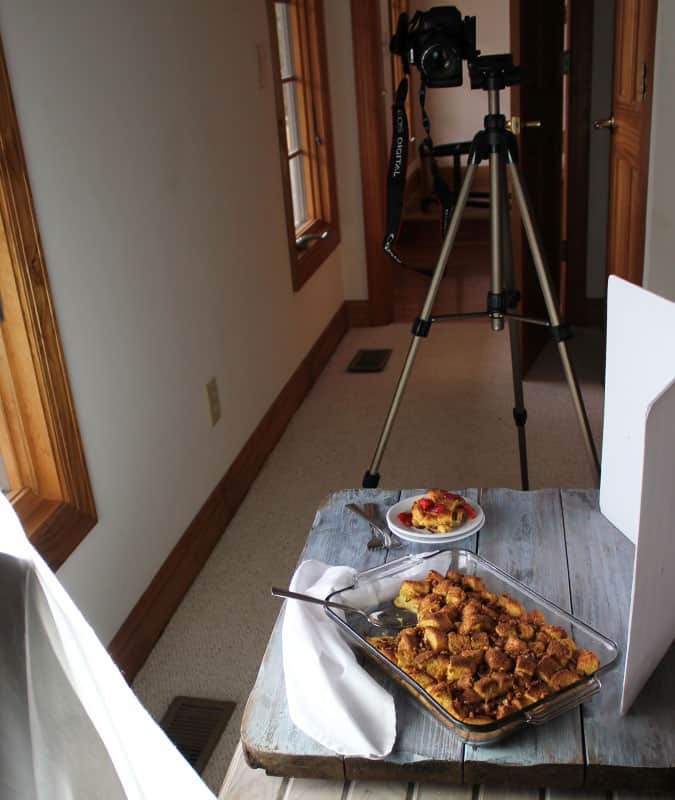 Luckily I had plenty of time to work with photographing this dish… it doesn’t work out that way often! 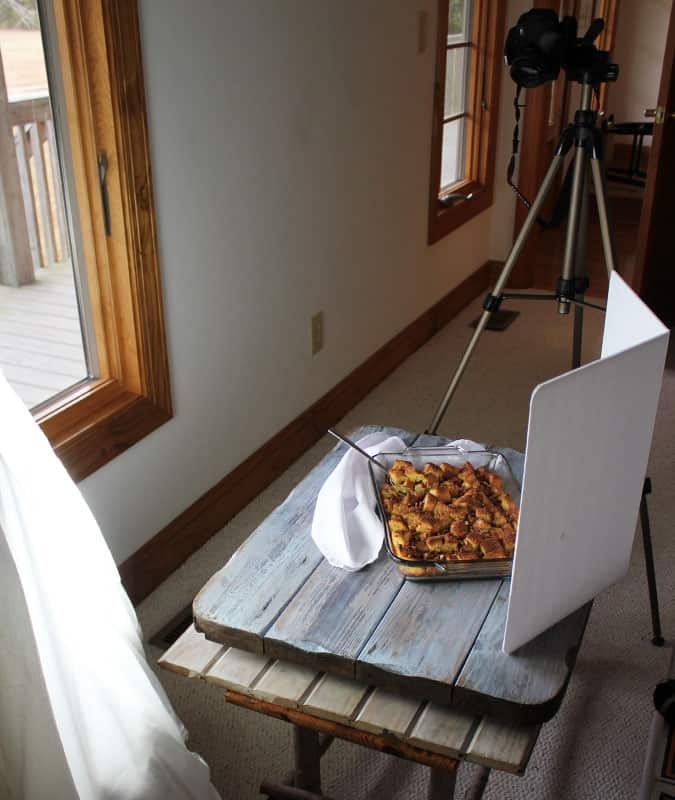 Especially with casseroles that have cheese and sauces that need to be photographed as quickly as possible. So this is how I started out (don’t pick on the Crown Royal box… I grabbed the first thing I could to place my oven mitts on!). It was severely overcast and cloudy outside so I broke out my Lowel EGO light for an extra light source. I covered it with a sheet to diffuse the light so it wouldn’t be so harsh. Sometimes I’ll use these really cool vinyl backdrops that look like wood that I order from Swanky Prints on Etsy. 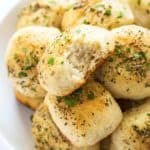 I like them because they’re easily transportable (you can roll them up and put them in a tube), clean up easily and you can place hot dishes on them. But for this casserole, this background just didn’t work out. I wasn’t happy with this at all. Very blahhhhh and boring. I stopped right there because I knew I wasn’t going any further with this background. I changed backgrounds to this lighter colored board and added a white napkin and a serving spoon. 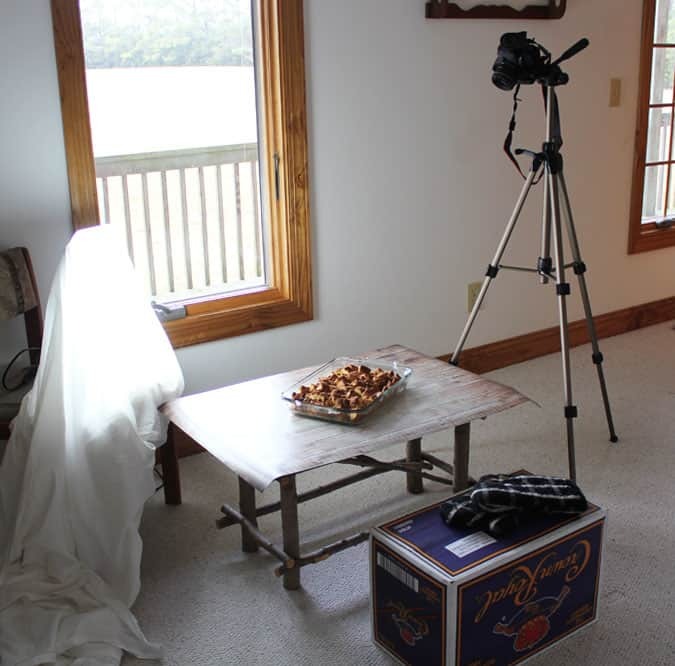 I also set up my white reflector board to bounce the light onto the casserole. This wooden background board was an old side table that I found at a flea mall for $3! I removed the legs and eventually lightly painted over the wood. Much better, but still somewhat boring. Then I placed a serving of the casserole on two stacked plates with forks. I also added some sliced strawberries on top. Luckily the day before I took some frozen strawberries out of the freezer to thaw. BINGO! It took me trying all of those different ways before I got to this shot, but I was very happy at this point. 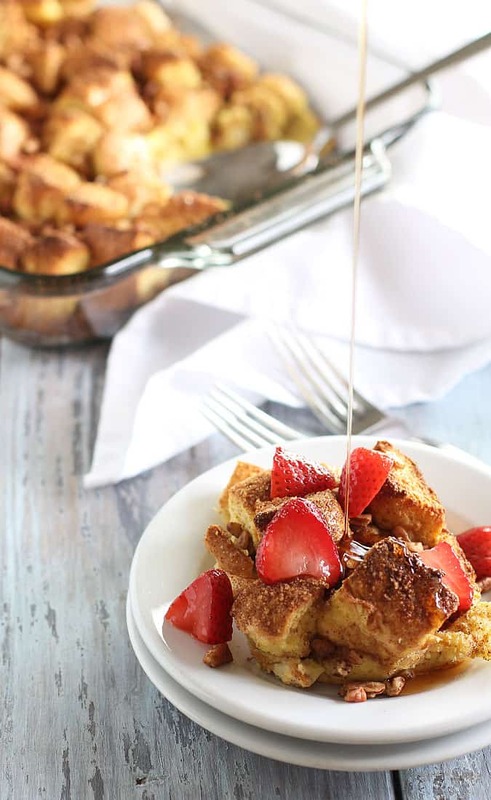 I was so thankful that I remembered to thaw those strawberries, as they added a bright splash of color that was needed (and they were very tasty on the french toast casserole!). I edit all of my photos using Photoshop Elements. The camera that I use is a Canon Rebel T5i with a 50mm f/1.8 lens. The day I took this photograph, my friend Melissa was nice enough to let me try her EF 50mm f/1.4 lens… I love it! As I’ve said, I’m no expert and food photography is a continual journey and learning experience for me. 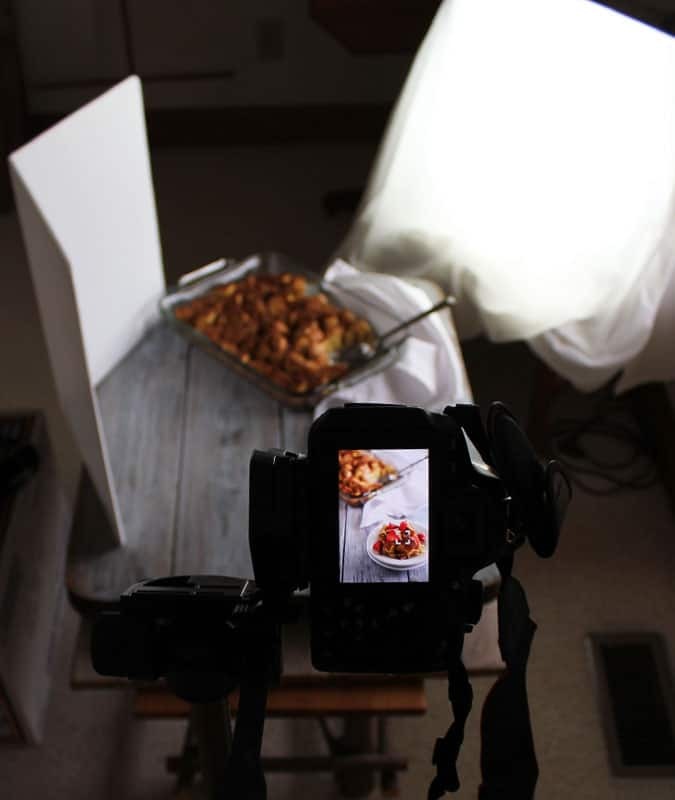 If you’re into food photography and have any tips or tricks you’ve learned along the way, feel free to share in the comments below! 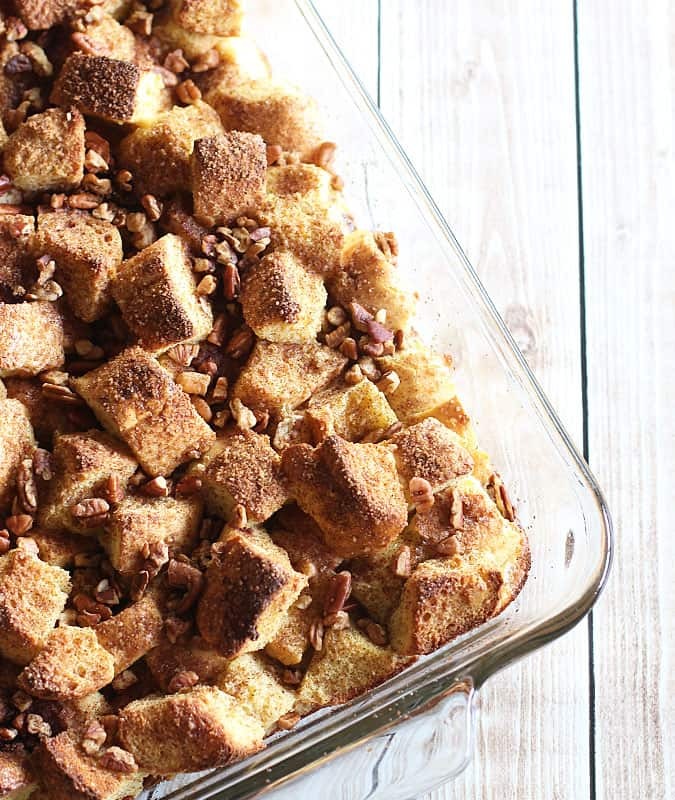 Want the recipe for this easy Overnight Eggnog French Toast Casserole? Get it here. 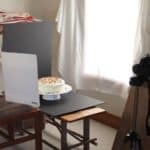 Love seeing behind the scenes for your food photography. Your pictures are always gorgeous! Hope you had a Merry Christmas! Thanks! I did and hope you and your family did too. Happy New Year! 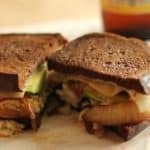 Oh, I’m loving these posts! I’m going to look into a wireless remote. I could SO use that in a lot of my step-by-step photos and the finished shots as well. I work very much the same way that you do. I only start with a vague idea of what I want and then it just kind of organically unfolds. There are so many factors – the weather, the time of day, etc. that you can’t control and it can just completely change your original plan. The french toast shots turned out beautifully!